DIXON – A new event will begin in a month in Dixon to "enliven the downtown and get people out walking to see what's going on in their cultural community." "Second Saturdays Art Happenings" will showcase the town's art, music and theater offerings as visitors bop from venue to venue, organizers say. The event will launch next month, on March 13, with activities at five downtown venues, including a hair salon and a church. "The idea is to get people to get out and walk the streets and check out the galleries" – like a pub crawl, said artist Lisa Higby LeFevre, one of the event's organizers and owner of Distinctive Gardens. "Traditionally, it's when all of the galleries will be open at the same time, usually once a month, and do different things on that particular night," Higby LeFevre said. Second Saturdays is designed to get people interested in what's going on with the community's artists and galleries. People who usually are interested only in music can get a taste of the visual arts, and vice versa. It will increase community pride, and make Dixon a more attractive place to live, organizers say. Nontraditional venues are part of the attraction. Episcopal Church of St. Luke, for example, will present organ music and will offer its first art exhibit, paintings by the late artist Gordon Utley. "It's exciting to have a town with an active base of artists," LeFevre said. "There's a tremendous wealth of quality art." LeFevre suggested an art hop a few years ago, but the arts community wasn't ready for it, she said. 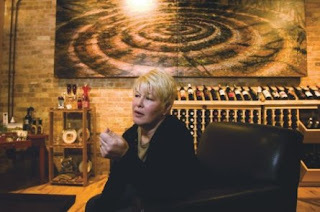 The idea resurfaced when The Crystal Cork Wine Shoppe and The Next Picture Show both had openings the evening of Nov. 6, and she and local photographer Rick Munson noticed how many people bounced back and forth between the two galleries. They got to talking on Facebook, talked with other artists, and the idea caught on, she said. Each Second Saturday will feature different venues and events, and The Next Picture Show plans to participate in three of them, organizers say. The first Second Saturday will be held in downtown Dixon from 6 to 8 p.m. March 13. ■ The art trek begins at Crystal Cork Wine Shoppe, 219 W. First St., which will offer its quarterly show, "Dissolution," which is photography by Hope Greene; and an artist's reception for the pastels "Atmosphere" and "Time Passages," by Lisa Higby LeFevre. ■ Acrylic artist John DeLong will showcase his paintings and put on a demonstration at his business, JSalon, 208 W. First St.
■ The next stop is Trein's Jewelry, 201 W. First St., which will feature Czechoslovakian art glass and a guest artist to be announced. ■ Books on First, 202 W. First St., will present music by Maddies Farm from 7 to 9 p.m. Art exhibits are a regular feature at the coffee shop and bookstore. ■ The hop ends at Episcopal Church of St. Luke, 221 W. Third St., where the late Gordon Utley's paintings will be displayed and organ music will be performed. The next art walk is April 10. Groups and artists interested in participating in Second Saturdays can contact Lisa Higby LeFevre, lhlefevre@comcast.net or 815-285-0014, or Theresa Sholders, theresa@essex1.com. or 815-285-3496. More information also is available at www.Second-Saturdays.com online.